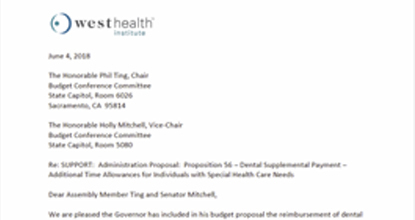 We are pleased the Governor has included in his budget proposal the reimbursement of dental providers for the additional time spent delivering all necessary dental services for patients with special health care needs. We ask for your approval of the administration’s proposal. As President and CEO of the Gary and Mary West Health Institute, a San Diego-based, nonprofit applied medical research organization dedicated to enabling successful aging, I write on behalf of California’s low-income individuals living with chronic medical, mental, behavioral, or developmental disabilities who currently face greater challenges in accessing appropriate dental care than healthier people. We understand the impact of providing dental services to people with special needs through our relationship with the Gary and Mary West Senior Dental Center (GMWSDC). The Gary and Mary West Foundation supported the development of this community dental clinic housed within a Senior Wellness Center increasing access to dental care for a very vulnerable population of older adults in downtown San Diego. A substantial proportion of the GMWSDC patients live with serious oral health issues, including pain, infection and malnutrition, due to dental disease. Eighty-five percent of the Center’s patients are Denti-Cal beneficiaries. Many have not seen a dentist in years—for others it has been decades, due to the costs associated with dental care. We know that treating these patients often requires more time because usual methods of performing dental procedures are not feasible and/or extra time is required to appropriately manage their medical or mental health conditions. Many of the GMWSDC patients cannot tolerate being in a dental chair long enough to have necessary treatments completed and others require additional medical screenings at every appointment prior to being treated. providers’ ability to receive proper payment for their care. the Gary and Mary West Senior Dental Center, visit SeniorDentalCenter.org.